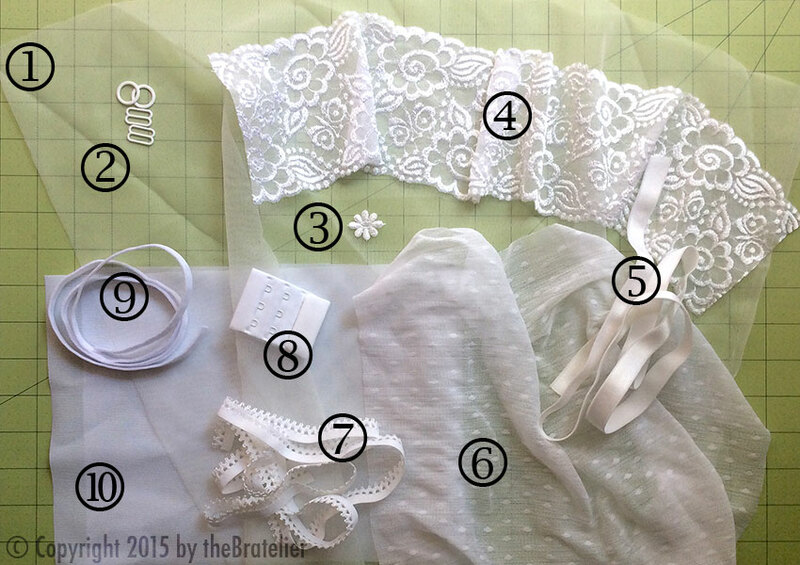 My last post was an introduction of sorts to my current project: The Little White Bra, a.k.a. The Bra Before Dyeing (or just “Before”). 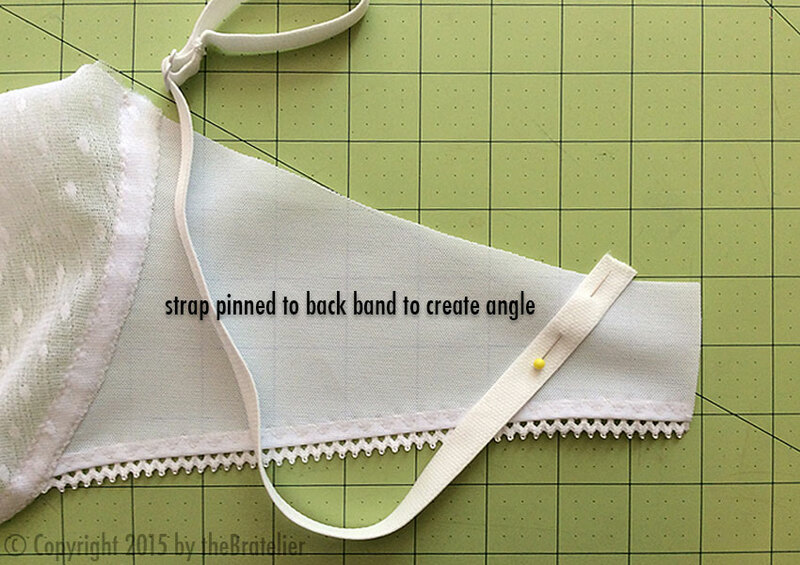 Now, since this was the first time I’ve used this bra pattern, I’ll show you how I made it, including a few changes I made. Because I was already planning to dye this bra after sewing it together, the most important part of planning was to choose dyeable fabrics. Lest this sound terribly obvious, the truth is, if you just go by the scanty instructions on many dyes, you might get the wrong idea about the types of fibers you can dye with them. I have a lot of experience with dyeing yarn, mostly with acid dyes, which are suitable for animal fibers and nylon, so for this project, I’m aiming for as many nylon-based materials as possible. Some, like the back closure and the flower embellishment, have less than 100% nylon, so I anticipated some parts turning out slightly different shades. That’s okay— I’m not really going for a spray-painted look. Note: I’m not going to show every single step of making this bra in detail here; I’m focusing more on the things I did differently than the pattern. Do let me know if you have questions about this pattern and/or project! 1. Sheer non-stretch cup lining. 2. Rings & sliders for straps. 3. Flower embellishment. 4. 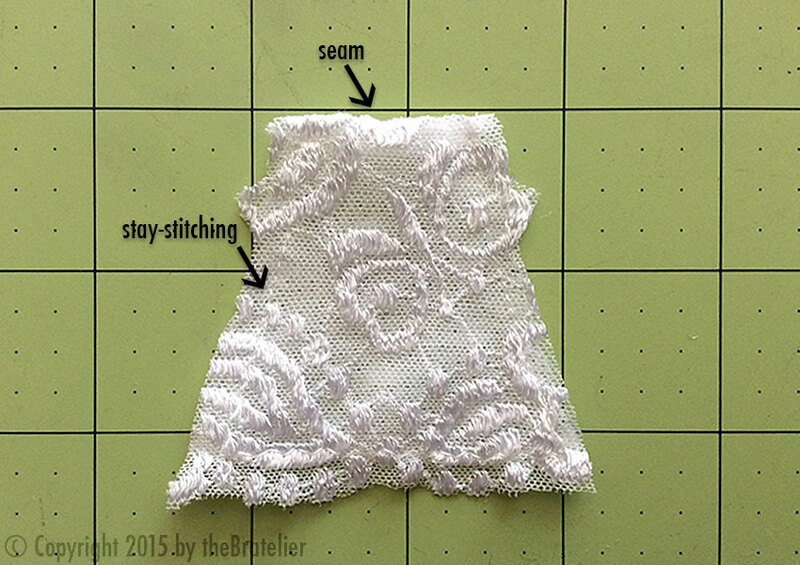 4″-wide stretch lace. 5. 5/8″-wide strap elastic. 6. Swiss dot stretch fabric. 7. Picot elastic trim. 8. Heat-sealed back closure. 9. Underwire channeling. 10. Power net fabric. Not shown: underwires. 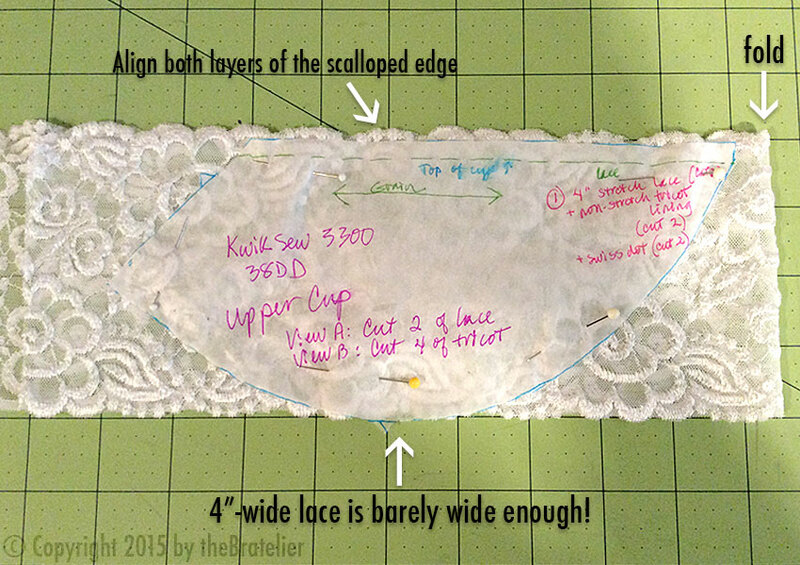 Here’s the upper cup pattern piece on the lace trim, which has been folded and the scalloped edges aligned so the top edges of both cups will match. 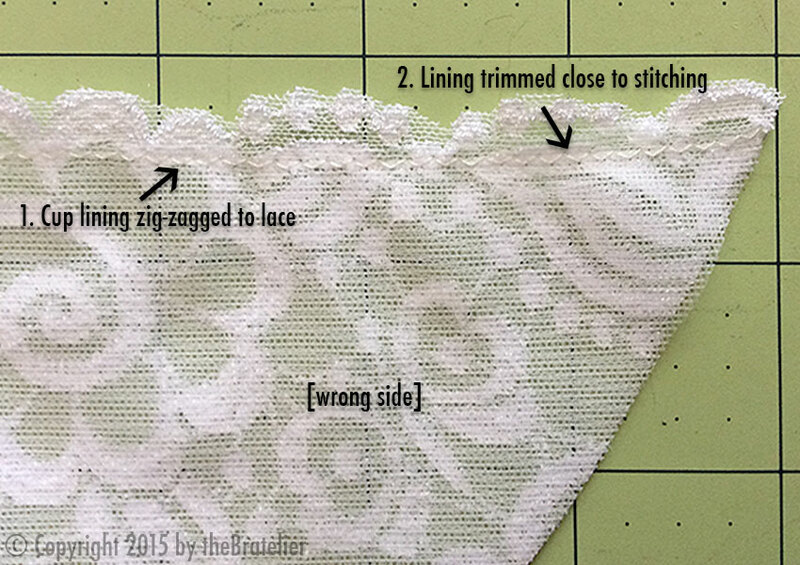 First, I zig-zagged the cup lining to the lace (1), then trimmed the excess from the top of the lining to just barely above the stitching line (2). This cup lining does double duty as a stabilizer for the upper edge of the cup (please note that this is different than in the pattern instructions). After sewing the seam at the top edge, and turning the bridge right-side out, I stay-stitched all 3 layers together, about 1/8″ from the edge. Tip: Here’s the thing about sewing that seam at the top of the bridge: it means the bridge piece won’t come up as high on the cups when I sew the bridge to the cups. This was only an issue for me later, because when I put in the underwires, they came up above the top of the bridge, creating a small gap. There’s excess length in the underwire channeling here; the arrows are pointing to where the underwires will actually end. So sewing that seam at the top of the bridge means that there is a gap there. Here, I’ve pinned a strap in place on the back part of the band, to create an angle rather than having the strap go straight down from the shoulder. I’ll baste the straps in place near the top edge of the band. Now you can see the slight angle of the strap. I’ve sewn the first pass to apply the elastic trim, over the strap; the second pass will be the 3-step zig-zag, as you can see on the finished lower edge of the band. 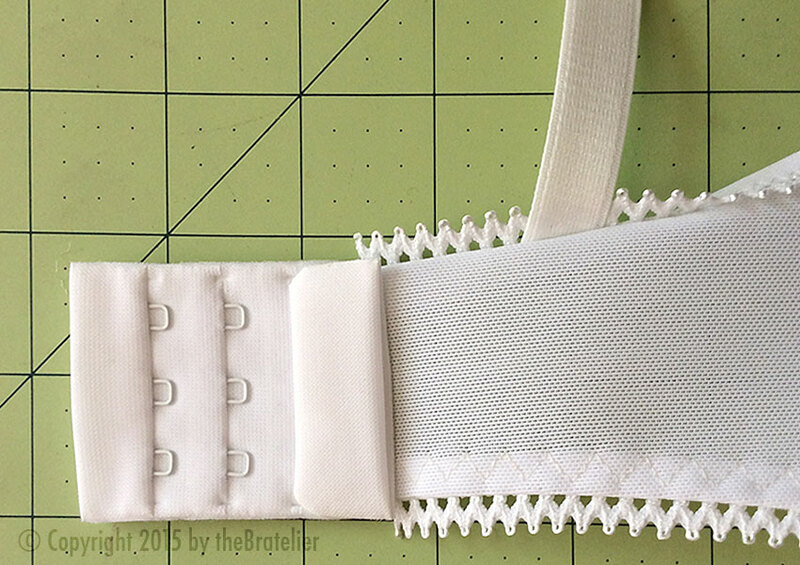 I’ve placed the closure here, so you can get a sense of how close the strap is placed to the center back. Although I actually liked the look of the underwires extending up past the top of the bridge, I decided to use my little flower embellishment to bridge the gap. Good example of “mistakes” being the mother of creativity! Even though the angle of the straps where they meet the band is fairly small, I think it will help to keep the straps on my shoulders. It’s done! 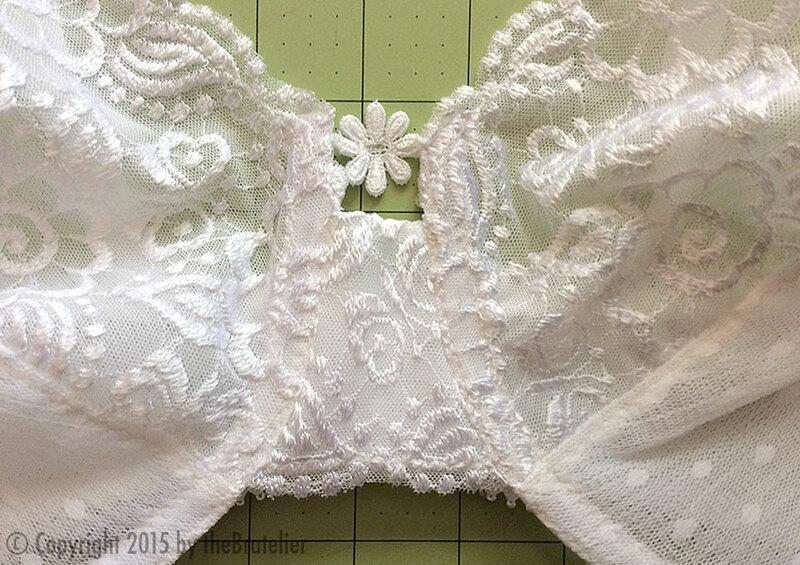 I’m almost regretting that this bra is destined for a dyeing experiment— I really like my LWB! Next in this series: I’ll show you how I ombré-dyed my Little White Bra! UPDATE: Kits to make this very bra are now available! The pattern is Kwik-Sew 3300, View A. The flower embellishment, power net, and Swiss dot fabric came from my local fabric store, Mill End. The heat-sealed back closure, plush-back underwire channeling, strap elastic, and non-stretch cup lining all came from ArteCrafts. Well, the obvious difference is that one is full-band and the other is partial-band. And it’s hard to make a fair comparison because the full-band one turned out to be too small. I followed the pattern recommendation to use my RTW bra size (36DD), and both the cups and band were small enough on me to make it uncomfortable. So I decided to go up to 38DD for the partial-band style, and it fits me nearly perfectly! The only thing I would change is bringing the underwires a little closer together at center front, but that’s it! Nice pictures with very good explanations. Your treatment of the center bridge is elegant! I really like the picot elastic trim with deep “v” edging. Where did you find it? I got that trim at a local fabric store, but I think I’ve also seen it as sewsassy.com. Thank you for including such detailed instructions. I have been working on this pattern. I used lace for the cups but did not line them — there was my problem. Everywhere it says the cups should be made of firm material or rigid lace. I’ve been trying to make them of stretch lace for a little more comfort — but I have not been successful. Any suggestions. Thank you. That was a beautiful bra you made. I know what you mean about using the stretch fabrics— maybe we’ve just all gotten so used to everything stretching that we’re having to adjust to wearing rigid fabrics. But I’ve also found that the bras I like the best are the ones that have the least stretch; I just find them more supportive. Also, being able to stabilize a stretch fabric so it can be used for bra cups really expands your fabric choices! You’re asking for suggestions, but I’m not sure specifically what you’d like suggestions about. May I ask if you’re a larger cup size? I ask because I’m 36DD/E myself, and so support (i.e. rigid fabrics) is really important to me, but if you’re on the smaller side, maybe that’s not such an issue. But you do say that you haven’t been successful with stretch lace, so I wondered. Of course, the major issue with using rigid fabrics is fit; we all probably have to do some trial and error and tweaking of patterns to get a custom fit. Did you just use underwire channeling in this bra? Or did you actually use underwires in this bra? I know that with partial band they usually require the use of an underwire but I’m just curious. 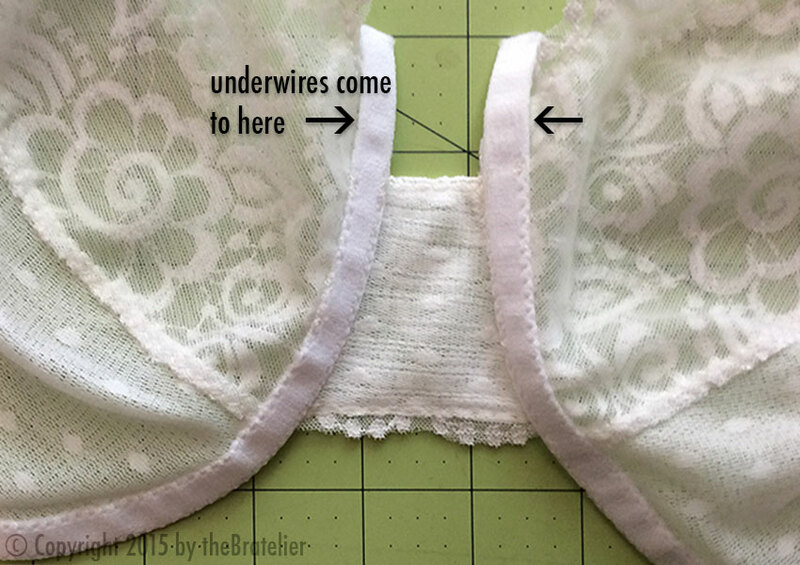 There are indeed underwires in this bra— everything I’ve read says that partial-band bras MUST have underwires, and, considering the way they’re constructed, this makes total sense to me. Just gorgeous. I so want to jump in and try…but just so afraid of failure…lol I know , I know….what could happen? I would get started. Hi Carol! Believe me, I completely understand your feelings. I’d been sewing garments for nearly 50 years before I plucked up the nerve to try sewing bras! If you have any experience at all with sewing, I say, give it a try! The fit is, of course, the biggest issue, but the sewing itself is really not very different than sewing a garment, with 2 exceptions: (1) lingerie typically uses 1/4″ seam allowances, which takes a bit of getting used to, and (2) the way elastics are applied can be different than for garments. Try it! And let me know how it’s going for you! Hi, Anna-Marie! I do not share patterns here, but I always share links to where you can find them. My suggestion would be to check out the Bra-Making Forum on Facebook (https://www.facebook.com/groups/bramakingforum/); they have tons of resources there including bra patterns (some of which are free), as well as expert advice on anything having to do with bra-making. It’s a fantastic group that I highly recommend.